I just had a transcendentally enjoyable afternoon watching two videos: the first one I’ll discuss (actually the one I viewed second) was an (at times) insightful, and always highly engaging, free online recording of David Lynch‘s beatific guest lecture at the University of Oregon on November 8th, 2005, which I can thoroughly recommend to Film Studies For Free‘s (small but growing) ‘bliss-seeking’ readership. The link is HERE; there are various viewing options but I found the RealPlayer one to be the most straightforward on this occasion (and it also allows you to record the video, if you want). There’s also a podcast version HERE. 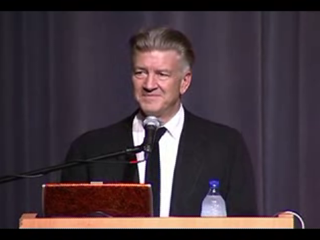 Following a lovely introduction by Associate Professor Kathleen Rowe Karlyn, the video shows Lynch amiably and very capably addressing a large gathering of fans and sceptics on the subject of “Consciousness, Creativity and the Brain,” with shorter speaking turns taken for part of the (nearly) two-hour long session by his fellow promoters of Transcendental Meditation, Drs. John Hagelin and Fred Travis. Much of what Lynch has to say, of course, treats the topic of TM. Lynch is also widely-known now (as well as for his films) for his eponymous Foundation which promotes this practice in the declared interests of ‘world peace’. But there is plenty in the Lecture about his films and filmmaking practice more generally, too, thankfully, hence FSFF‘s recommendation. If you want to skip the ‘science’, Lynch answers great questions from the audience for the first fifty minutes and then returns for some more questions one hour and thirty-two minutes in. A particular highlight for me was Lynch’s response to a question (about 28 minutes in) about Mulholland Dr. (USA, 2001): ‘What the hell is the box and the key?’. Lynch continues with an anecdote about the turning of the TV pilot version of his script into the full-length movie version. This, in turn, is immediately followed by a nice story I hadn’t heard before about Lynch meeting Federico Fellini just before the latter’s death in 1993. It turns out, though, that Lynch has done this same gig numerous times, including at other universities. So, if you are a true believer, or you just really want an overload of “Consciousness, Creativity and the Brain,” or if, like me, (for a [meagre] living) you study what directors repeatedly say about their work, you could try out the Google Video of the talk as given on the day after the UOregon lecture at UC Berkeley, click HERE. Or, there’s a Google search page HERE giving a list of all the other, online and free video versions of this talk out there in cyberspace. There is not a trace of amateurism about Ed’s Co-ed. The story is that of every college movie you ever saw – country boy Ed comes to college, is picked on by other students, he falls for the girl but is rejected by all after he admits to a crime to cover up for someone else who actually committed it, his talents are recognised (he plays the violin, he’s top in all his grades), he wins through at last. It’s so like every college film made that you could be fooled by its ordinariness, but this is a college film that actually came from a college, and it is a treasure trove of period attitudes, codes, fashions and language. McKernan gives the great link to the streamed and downloadable versions of the film in the UOregon website. I thoroughly enjoyed this film (before Film Studies For Free‘s Lynch marathon) though would have loved to have seen it at Pordenone with the live accompaniment from Neil Brand (piano) and Günter Buchwald (violin).